This medication is used alone or with other medications to treat rheumatoid arthritis. It helps to slow joint damage and reduces the joint pain/swelling caused by rheumatoid arthritis so that you can move better. Anakinra is a man-made form of a natural protein (interleukin-1 receptor antagonist) made by the body. It helps to block the effects of another protein (interleukin-1) which can cause joint pain/swelling/stiffness. Anakinra is also used to treat a certain condition called Neonatal-Onset Multisystem Inflammatory Disease (NOMID). It helps to improve symptoms of the disease such as fever, rash, joint pain, vomiting, and headache. Read the Patient Information Leaflet if available from your pharmacist before you start using anakinra and each time you get a refill. If you have any questions, consult your doctor or pharmacist. If you are giving the shots yourself, you will be trained by a health care professional on how to properly prepare and inject this product. If any of the information is unclear, consult your health care professional. This medication is injected under the skin (subcutaneously), usually once a day or as directed by your doctor. Do not shake this medication. Before using, check this product visually for particles or discoloration. If either is present, do not use the liquid. Let the medication warm to room temperature for 30 minutes before injecting it. Before injecting each dose, clean the injection site with rubbing alcohol. It is important to change the location of the injection site daily to avoid problem areas under the skin. Do not inject this medication in an area that is tender, red, bruised, or hard or which has scars or stretch marks. Do not reuse the syringe. Learn how to store and discard needles and medical supplies safely. Consult your pharmacist for more details. What conditions does Kineret Syringe treat? Redness, bruising, swelling, and pain at the injection site may occur. These skin reactions are usually mild and may last 2 to 4 weeks. If any of these effects persist or worsen, tell your doctor or pharmacist promptly. Anakinra has caused very serious infections (such as skin/bone/joint infections, pneumonia). Tell your doctor right away if you develop signs of an infection, including: fever/chills, persistent sore throat, cough with mucus, spreading redness/swelling/tenderness of the skin, bone pain. List Kineret Syringe side effects by likelihood and severity. Before using this medication, tell your doctor or pharmacist your medical history, especially of: current/past/returning infections (such as tuberculosis), immune system problems (such as HIV disease), kidney disease, asthma. What should I know regarding pregnancy, nursing and administering Kineret Syringe to children or the elderly? Some products that may interact with this drug include: abatacept, TNF blockers (such as adalimumab, certolizumab, etanercept, infliximab). 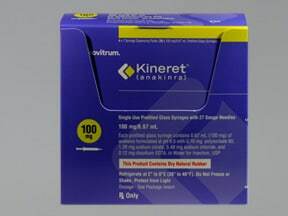 Does Kineret Syringe interact with other medications? Laboratory and/or medical tests (including blood tests such as absolute neutrophil count) should be performed periodically to monitor your progress or check for side effects. Consult your doctor for more details. Store in the refrigerator between 36-46 degrees F (2-8 degrees C) away from light. Do not freeze. Keep all medicines away from children and pets. 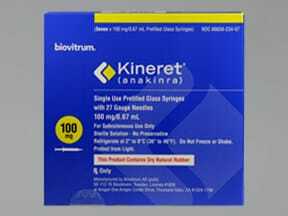 Are you taking Kineret Syringe? Are you considering switching to Kineret Syringe? How long have you been taking Kineret Syringe?